This article is retracted by the Editor-in-Chief as several figures included in this article have been found to have high degrees of similarity with previously published works, viz. “Effect of Dynamic Cross-Linking on Melt Rheological Properties of Polypropylene/Ethylene-Propylene-Diene Rubber Blends” by Anil K. Jain, Neeraj K. Gupta, A. K. Nagpal, Journal of Applied Polymer Science, Vol. 77, 1488–1505 (2000). “Effect of Dynamic Crosslinking on Impact Strength and Other Mechanical Properties of Polypropylene/Ethylene-Propylene-Diene Rubber Blends” by A. K. Jain, A. K. Nagpal, R. Singhal, Neeraj K. Gupta, Journal of Applied Polymer Science, Vol. 78, 2089–2103 (2000). We were never contacted by the Journal concerned for any explanation regarding any similarity of our research work with previous published work. In case if they had done this i would be pleased in providing any justification in this context. The case of retraction is beyond justice without author’s acknowledgement and reply. None of our paper is retracted earlier and none is under process. We were never given any opportunity to explain our position. I am not aware that these two papers have been retracted. The Journal should have asked us to put our views so that we can get a chance to defend our case. This is a case of clear cut one sided decision. There is no similarity in our work in case if this exists then why our papers got published at that time long time back. There are so many steps with which a paper has to pass including comments by expert reviewers who are expert in the field of research. If that had been the case then why the journal had not pointed out and rejected our papers at that juncture. In retraction note it had been mentioned that similarity with Anil k Jain et al., has been found. In this context in our two papers the motive behind our research is entirely different. I have read both the papers and their contents seriously with interest and found that the authors have worked on ter- blends of IPP/EPDM/NBR while our work was on blends based on PP/EPDM. I found that they have not copied any material in the form of figures & graphs from our below mentioned publications…The figure’s and graphs shown by them are based on their research work well explained in their paper. I do not have any objection on their publication’s and have told the same in my verbal communication towards investigation from Journal Intl J Plast Technol . Keeping above facts in view the status of their retraction be withdrawn. We emailed Jain ourselves; he told us he did not have an institutional email address. 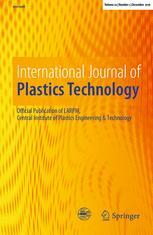 We emailed the editor in chief of the International Journal of Plastics Technology, but have not yet heard back. Neither of the retracted articles are indexed in Clarivate Analytics’ Web of Science, formerly part of Thomson Reuters. -All authors of the retracted papers failed to reply to email enquiries by Springer. Author Harjeet Singh was reached by telephone and he did not offer any explanations over the phone to defend his case. He informed a Springer representative that he had received emails about the complaint and he was asked to forward these emails to a Springer representative. These emails were never received by Springer. -Anil K. Jain (an author of the original content) saying that he has no objection to other authors copying his data does not make it ethically acceptable for authors to copy his data. Harjeet Singh told a Springer representative in a phone call that he had received emails about the complaint. The Springer representative asked the author to forward the emails to Springer but we never received them, therefore we cannot confirm who these emails were from. Interesting, if its a case of plagiarism then it makes sense (but why plagiarize yourself? ), but if the journal thinks they reused data then that could be a problem, though having a mechanism to deal with hiccups in this process would still make sense. If they just think duplicate research is unnecessary then they are wrong, a cornerstone of science it is repeatability.